As Americans prepare to celebrate the Thanksgiving holiday, many parts of this country are still facing water shortages and drought. Thanksgiving is a good time to practice indoor water conservation and below are a few ideas on where to start! After Thanksgiving dinner, approximately 30 million Americans will watch football. At halftime, American toilets will flush 30 million times and use 108 million gallons of water – enough water to fill an entire football stadium! Water efficient toilets would save 62 million gallons of water. Thaw your turkey in the refrigerator instead of running it under tap water. For fluffy potatoes, use a little water- not a full pot. Use charms or labels to cut down on extra glasses. Wash full loads in the dishwasher with environmentally friendly detergent. For black Friday, apply for a water saving rebate online! Don’t Pour that Grease Down the Drain! During these coming holidays, cooking will be a major priority for many households and restaurants across the country. Almost all cooking involves the use of cooking fat such as grease and oils. Most of us are aware they go a long way in ensuring the foods we enjoy are appeasing to our taste buds. However, if not properly disposed of, they can take a destructive toll on the environment and your piping system. After you’ve finished cooking your favorite holiday turkeys and hams, it’s easy to dump the excess grease and oil down the drain without giving it second thought. It’ll just get washed away, right? Well, not exactly. When fats, oils and grease are dumped down the drain, it forms large, thick grease balls that clog pipes. Clogged pipes can result in sewer backups and spills, create environmental problems, and even flood home and businesses. Most sources of oil and grease are insoluble in water. Harmful effects on the environment could be sewer flooding in your neighbourhood or pollution in local streams. These fats coat animals and plants with oil and suffocate them by oxygen depletion. This cooking waste also destroy habitats, produce rancid odors, foul shorelines, and clog water treatment plants. Sometimes people think they can flush grease down the drain with hot water, but that grease quickly cools and builds up in pipes. The toilet is not a suitable solution to pour your grease either. The grease will still harden in the plumbing underneath, potentially leading to some pretty grim consequences. So what in the world are you supposed to do with it? Luckily, it’s easy to avoid problems like these with simple, free, cheap alternatives that can help you get rid of leftover cooking grease safely and responsibly. For starters, using less fat to begin with means you have less to dispose of after cooking. Sometimes, the spray cans allow for minimal, more controlled use during cooking. Instead of discarding grease and oil down the drain, dump it in a cup or jar, wait for it to cool, and throw it in the trash, as shown in the image below. Even a small amount of oil dumped down the drain can build up over the years and wreak havoc on not only your drainage and sewer system, but your local water quality and environment. Instead of deep frying, roast or broil in the oven, shallow-fry in a pan on the stovetop, or use the grill. When sautéing, decrease the amount of fat a recipe calls for (use a teaspoon instead of a tablespoon, for instance). Replace oil or butter with small amounts of water or stock. Add a little at a time to keep food moving and browning in the pan without steaming. Measure fats instead of free pouring them. Trim visible fat on cuts of meat (and put the trimmings in the trash or give them to your dog or cat). Choose leaner meats at the market. Steam vegetables instead of sautéing. Once you’ve poured out the grease properly, make sure to wipe out your pots and pans with a paper towel to remove any grease that might be stuck to your cookware. Be sure to do the same with plates! Use leftover fat for future cooking and repurpose your cooking grease. Turn it into other things: From candles to dog treats, there are lots of ways you can put leftover cooking fat to use around the house, in your yard, and even in your car. If you don’t want to re-use your grease at home, some areas offer recycling programs for safe cooking oil disposal. Check if your municipality has a grease recycling program like Durham, which accepts and recycles cooking oil free of charge. As for toilets, remember that only toilet paper should be flushed. Most wet wipes are not meant to go through our pipes and sanitary napkins and tampons should never be flushed either. We are fortunate that our sewage treatments systems are top-notch, but that doesn’t mean we should overload them. When in doubt, throw it out! While petroleum spills capture all the attention, it’s clear the potential harm grease and oils can have is significant. This holiday season, make sure to keep our stormwater clean and our stormwater systems functioning at peak efficiency by keeping it out of the drain. It is widely known how important water is to our lives and the world we live in. As stated earlier, our planet is comprised of about 70% water, making it seem like it is easily accessible and plentiful. However, when you rule out our oceans and ice caps, less than 1% of all the water on Earth is drinkable. Safe drinking water is a privilege we often take for granted while we brush our teeth or drink a glass of water in the morning. While we are giving thanks to our family, friends, and food during Thanksgiving, we should also give big thanks for our clean drinking water and the people who make it happen! Keeping yourself hydrated can do wonders for your health. The benefits water provides for our bodies range from relieving headaches, flushing toxins out of the body, improving mood, helping with weight loss, and relieving fatigue. In the U.S., we are fortunate enough to have some of the cleanest drinking water anywhere in the world to keep us healthy and safe. In other countries that is not the case. Many do not have access to sufficient drinking water and the water they do have often contains dangerous pathogens. Often, unclean water sources are miles from villages and some people are forced to spend hours each day simply finding and transporting water. With so many people not having access to clean drinking water around the world, it is important to appreciate the plentiful and safe drinking water we have here in America. A Special Thanks for the People Who Make Our Water Safe! When looking at America’s clean water, it is especially important to give special thanks this Thanksgiving to the water and wastewater utilities that work nonstop to give us some of the cleanest drinking water in the world. Despite the fact that our country has beautiful rivers and lakes, the water that comes from them to our taps goes through several processes that require a lot of work and maintenance. Our water and wastewater utilities maintain some of the highest standards in the world when it comes to drinking water, and new innovations for treatment and distribution are always being researched and implemented. Water and wastewater employees work tirelessly to meet regulatory requirements and preserve local waterways despite major setbacks like deteriorating infrastructure and shrinking funding for necessary projects. On top of treating our water, utilities are responsible for keeping their distribution systems running efficiently and also to being stewards to the environment through improving effluent quality. Our water utilities are arguably the most important utilities in the nation because water is so crucial to our survival. 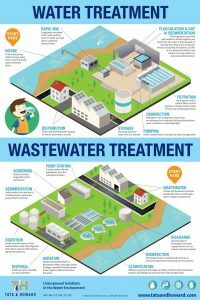 Check out the visual diagram below of water and wastewater distribution systems. We are so incredibly fortunate here in the United States to not have to think twice about the purity of water from the tap, a glass of water in a restaurant, a highway rest stop, an airport, or motel – all thanks to our water and wastewater utilities. For that, we should be especially thankful. This Thanksgiving, be sure to give special thanks for having safe drinking water and to the dedicated, hard-working people at water and wastewater utilities. Melting Snow, It’s Stormwater Too!